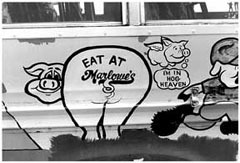 That we would find Marlowe’s on our first trip to Memphis in search of barbecue art, was about as likely as Ponce De Leon landing his flagship in the Fountain of Youth. You’re supposed to have to wait, to suffer, for that kind of payoff. We had a short list of places to go, and Marlowe’s was not on it. We must have been headed for A & R because we took the Elvis Presley exit. But we must have turned the wrong way because A&amp;R is north of 55 and we were headed south. 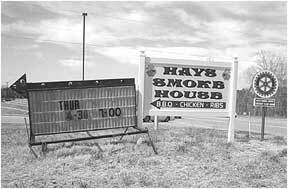 We went a few blocks, eyes pealed for pigs, but came up with nothing but a couple of cowboy chickens. We saw it at the same time. We spent too much time gasping and gawking to stop. If there had been a car in front of us, my engine would have ended up in its trunk. We pulled into the Krystal next door and parked in the back of the parking lot. Racing against time, we gathered our gear and ran from the car afraid that maybe it was a mirage, a hydraulic hyperbole that was in danger of evaporating at any moment. And then we were there. Amy in front of the pig van staring at Spider Ham. 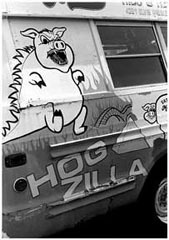 Me face to face with Hogzilla. Joe York: I am here with Melissa Coleman. It is the eleventh day of October, 2002. And we’re here at Marlowe’s Ribs and Restaurant. Well, you just said that you had been here since you were nine. So, your family started Marlowe’s? They opened the location here. Originally it was called White Haven Ranch House. 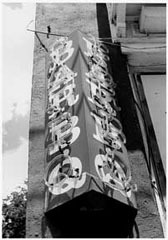 It was the first salad bar concept in this area. It was the second in Memphis . The Danver’s was what brought the salad bar here to Memphis . My father left the Marriott Corporation and started the Danver’s chain here. And so this was going to be a Danver’s. He decided not to and get out of the partnership, and opened it up on his own. And White Haven was booming, young, lots of money, and been here for a long time, and we went to Marlowe’s, it’s named after my sister, in 1982. 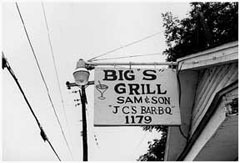 So, we’ve been here since ’73 until almost 2003, almost thirty years. And your sister is Marlowe? Yes, my sister is Marlowe. No. He’s Italian. Italians feel like they can cook anything. If you know many Italians, they’re very boastful in their cooking. They think they’re experts in everything. 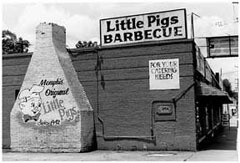 So, but we did hired the… Tops Bar-B-Q, was the first pit barbecue here in Memphis , and we contacted them and they built our pit for us. And we hired– and I wish I could remember the gentleman’s name, but I cant… and we hired him for a short time to train us and he basically just led us through his techniques and we’ve been successful most of the time. Unsuccessful, burned a few over the years, but we’ve probably had fifteen Grand Champion placements in ten years. 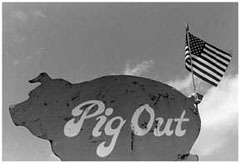 So, we’ve done very well, especially in whole hog competing because it’s more of a… I don’t want say it’s a local level… but like a southeastern level of the United States. Yeah. We’ve been very lucky. 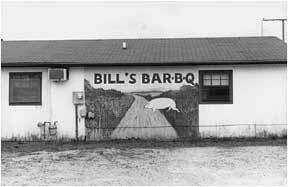 What are your specialties as far as barbecue goes? 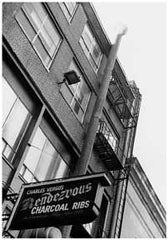 When we began Marlowe’s in ’82, our specialty was Italian being Italian-owned. 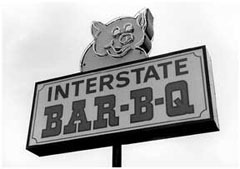 We still do our homemade lasagna, but when we went to pork– We do whole hog and that’s what we compete heavily on and very successful in competing, but we do mostly ribs. We do a thousand pounds of ribs a week. When it comes to pulled pork we do barbecue pizza, the barbecue nachos, not just the sandwiches, but we take the pulled pork and we do lots of different unique things with it. Here at the restaurant we do have a spindle that we cook a whole hog on, but in competition it’s more of a grill with heat that’s cooked to the side. It’s slow and low. And with this one we use electric heat. [She’s referring to the glass-encased pit in the center of the dining room. On the spit above the electric pit is a plaster pig. Painted on the side of the pit are the words ‘Love Me Tenderloin.’] But we use charcoal and hickory chips. But we do whole hog, and that is as much in the taste of the pork, but also it’s presentation. When you open him up and you look at the pig he should be beautiful and brown and nice and have an absolutely gorgeous presentation to him along with the meat having not so much a pork flavor, but a very unique individual flavor. 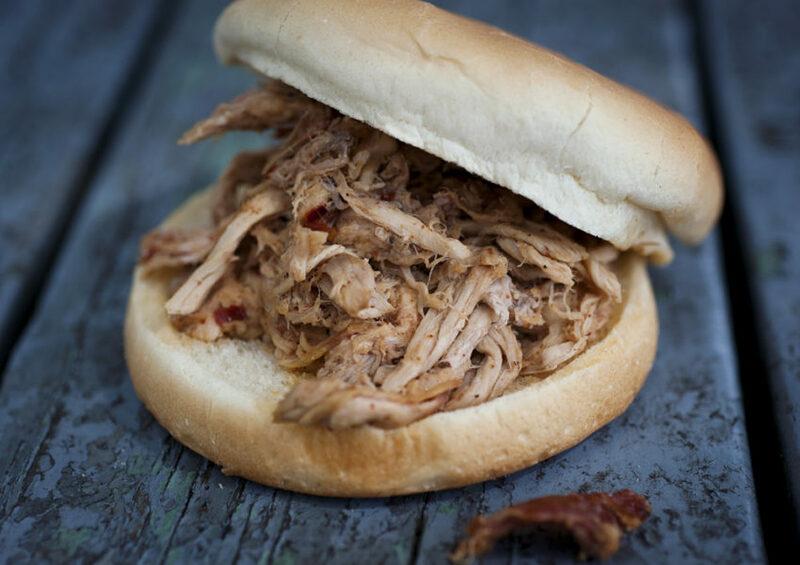 Because pork tastes like pork, but most everybody seasons it with garlic and apple juices and different types of marinade to give it a different kick or flavor. So, that’s what we do with ours also. Yes we have a blend as well as a marinade and we stuff him full of lots of garlic, but that’s where our Italian roots kind of come in. 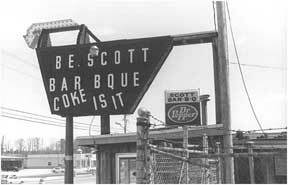 Well, how does that influence your barbecue? Because I would think that’s a weird mix, going from Italian to barbecue. It is a weird mix, but food is Italian. Period. Food is food. And Italians believe in eating, and eating well, and eating good food. So, we made the transition actually pretty easily. But we had to make the transition. No matter how much you like your own individual food, you could also be here by yourself. 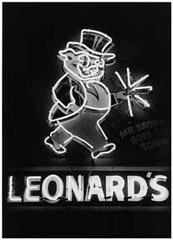 You have to change with the times and the times were dictating not so much heavy Italian, but the tourist-based industry was looking for Memphis barbecue. It has its own reputation, its own advertising base. 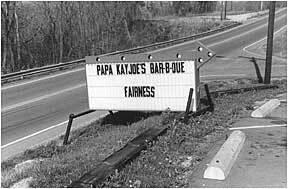 So, we had to change with the times instead of sending everybody all over Memphis to find Memphis barbecue, we had to adapt and learn how to cook it to present to the millions of fans who come through Elvis Presley’s place. We serve a lot of barbecue to them. We ship it all over the world. 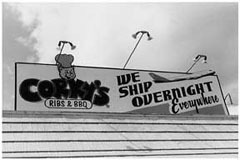 I have very loyal customers who will only have my ribs and barbecue and I do zero advertising when it comes to shipping. 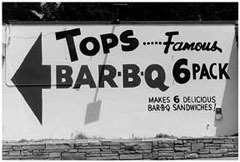 Was that the main reason for [changing to a barbecue based business], your proximity to Graceland ? Yes. Originally, back in 1973, it, Graceland … He was still alive. It was not the business that it is today. Like every community, the community has changed. 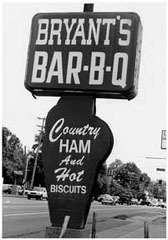 There were already local businesses and homes, and this was a very viable, very wealthy part of Memphis . So, we didn’t see tourists. That was not our initial trade. But over the last twenty-five years of Elvis’ death, it has only grown and grown. Where you’ve lost a little more businesses, a lot more homes are going further and further out east. So, you’re losing trade. And seventy-five percent of our night trade is out of the country, out of the state, Elvis fans. So y’all get all kinds? Oh, it’s interesting. It’s exciting. We’re actually spoiled. We meet people from all over the world that are very nice, they’re glad to be in Memphis . You give them a good meal, some southern hospitality, and they are so grateful. And they come in in a great mood. When you’re out on vacation, aren’t you smiling, relaxed. It’s unlike the stresses of school and work and somebody sits down with you and tells you a little bit about the history of their family business, these people are so appreciative. We’re very fortunate and very spoiled to have a relationship with so many out-of-towners. And so y’all have the pink Cadillac service? Yes. Well, we started out with the pig bus which caught your attention when you came by. It was an old school bus that we redid and Ruben Drewery had painted. And between my father, who has got the most creative mind. Coming from the Marriott Corporation, he could really think about future, not just now. And I’m a real now person. He can see what’s going to happen two years from now and follow it and go with it gracefully. So, we noticed that the KOA Campground right down the street, right beside Elvis’ place has lots of traffic. It’s probably one of the biggest campgrounds in this area. A lot of them were older folks that were with big trailers that they didn’t want to unhook. There wasn’t really a restaurant that was close by. 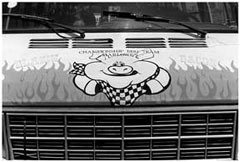 And with that campground we started picking up in this refurbished bus, this funny pig bus… You’d pull up and it was loud. It backfired. And they were having a blast. We were picking them up and bringing them back and forth. And the campground is the one that kind of initiated that. And then a customer came by and said, ‘I’ve got an old Cadillac limousine. There’s no trade for it. There’s nobody looking for old limousines.’ And my said, ‘You know, we’ll get one. Maybe upgrade a little and get them out of the pig bus.’ We started out with one limousine and then we got to four. And then with my father’s strange, creative mind, decided to paint them pink and make them stand out more, and part of Elvis. He did have a pink Cadillac at one time. People notice the pink Cadillacs. I have them call for weddings, to be picked up for weddings and brought back and forth. The chapel, Elvis’ chapel. I’ve probably picked up this past year twenty brides and grooms and either brought them up here or to their hotel, Heartbreak Hotel. So, the pink was a great idea. And how many of them do you have now? Yes. And they’re all running all the time. Of course, on the twenty-fifth four couldn’t even keep up. With my father’s really intuitive mind to the business, he noticed that out-of-towners, even if they have their own car, it’s so much easier to have somebody call for a free ride… because it a completely free service. So, not driving around Memphis a little lost, not sure where to go. There are times that you’ll look around on a Monday or Tuesday night and every one of the guests that are in here are people that we picked up. And that is so viable. What if you lost them between Point A and Point B and they turned off? We’re filling up our own restaurant even if we have to go out and get them. And I don’t know of any other restaurant in the world that will do that, go to your house, go to your hotel, and bring you back. Well, we try to keep in this airport area and we do do all the hotels for safety, but there are probably ten thousand hotel guests in this area every night. So they call and you say you’ll be right there. Yes. We have four drivers. Actually, my father’s favorite position in the restaurant is being the limousine driver. He was the first official limousine driver we had. He knows everything about Memphis , everything about Graceland , and he’ll talk to them and entertain them in between there and here. And it kind of completes their whole Elvis experience. Lots of pictures. People get their picture in front of the limousine. But Dad doesn’t… He’s not a very boastful person and the people don’t realize that he is the owner driving them and he gets a real picture of what’s going on. How was your meal? How was your service? And they think he’s just the limousine driver, but actually he is the person that takes everything very seriously. So, if there is anything positive or negative we know very immediately. So, that’s his favorite thing, is driving the car. He is very smart. He loves this business. He was made for it. He’ll never retire. He truly gets a lot of joy from the people. We make a good team. I’m very fortunate to have learned from such a master. But he was also the training manager for the Marriott Corporation. So, even when I was not even born they saw something in him. Marlowe is my sister. She is two years younger than me. I’m the oldest of three sisters. And jokingly we’ve always said it’s the middle child syndrome, you know, she never got anything as a younger child so we named the restaurant after her. She was with me for many years. She went to the University of Knoxville and got a marketing degree. Stayed here, worked with us, but had some growing pains. She was about thirty years old and wanted to try something and with my pushing her and wanting her to be more and successful, she is working in payroll services and is a top-notch female salesman in the city of Memphis . She is on the top of her trade and people know her and they even still know her from here, from the restaurant. Everybody knows Marlowe. She still comes in and eats for free, and visits, and will help me with anything. But when it comes to working she’s actually outgrown me and I’m sad to see that. Tell me more about the van. Because when I talked to Ruben, he basically said that most of the ideas for those different kinds of pigs came out of a late night around the bar in the back. Were you there? Well, yes. And it’s amazing how intelligent people are when they’re sitting around the bar having a beer. A lot of my customers take this restaurant almost as their restaurant. They feel very close. We ask a lot of their opinions, what they think. We bring them in because some of them have a lot of great ideas. Some of them came up with… I guess Superman was big at the time. ‘Why don’t you paint a Superman with a pig face on it? !’ And as the creative juices and beer got flowing it went from KISS pigs… There’s the faces of the KISS band members with pig faces. And mayor pig. And we just all started having fun. There’s probably thirty people’s input on what should have painted on there along with a really creative artist with Ruben Drewery, that has been somebody we’ve known for twenty-five years and seen grow and develop into a fine artist. There’s a king pig on there which is kind of Elvis-like, but not quite. When we talked to Ruben a while back he was getting at the point that Graceland didn’t want y’all to have an Elvis pig. Right. We have to be real careful with the relationship with Graceland . You can’t step on any toes. So, no you can’t have Elvis’ face or a picture or anything on that. So, yeah, it wasn’t so much poking fun, because we’re so grateful for Elvis. Today he’s the reason for my children can go to private school. But in some ways it is poking fun. It’s amazing at twenty-five years the amount of how such a king he is that people keep coming year after year. Thank goodness they do. Obviously, it’s kind of community here in the restaurant. Are there specific customers or people who y’all really like to see come through the door? George Klein, doing the Elvis radio show, he very close personal friend of my mom and dad’s. He did his deejay show from here for probably seven or eight years on Sunday night here. Of course, now he’s down making the big times down at Horseshoe Casino and doing well for himself. 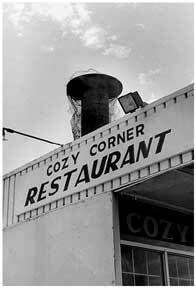 I know Graceland employees call this place ‘Elvis Presley South.’ Before they opened up their restaurant, this is where they came for their meetings, for their runaways. Jack Soden brought Pricilla Presley in here when they were talking about the stamp. So, I feel so very much a part of Elvis’ estate. There are so many people I’ve met. I was invited to go to the “Lilo and Stitch” premiere with Elvis employees. We meet people everyday that are famous that come in town, one, to perform, or two, to see Elvis’ house. We’ve had the U2 group through here. Everyday we meet famous people, but we treat famous people the same as if they were family. We treat everybody the same way. So, we don’t have this wall of pictures of people we’ve met. 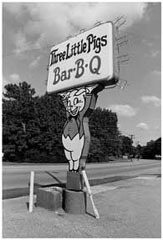 Tell me about the ‘Love Me Tenderloin’ pig. Who actually created that is Ruben Drewery. Ruben’s behind that. Now, who’s the creator of the cooker idea was my father. 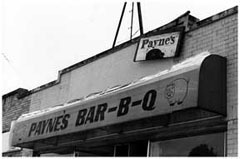 There are lots of restaurants that are very unique where they have their cooking or their grilling happening where the customers can see or participate in. He likes that idea. He likes customer involvement. So, he came up with this electric cooker, which is obviously not the most efficient way, but it was the only way to bring a cooker out here in the middle of the dining room. There’s was no mold. There were no directions. 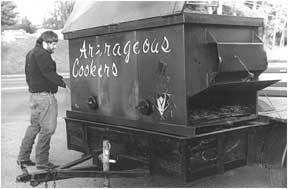 He had friends that worked with steel, worked with… And he brought in everybody he knew that had some input and created this cooker. They had no blueprint. It is out of the mind of about three very intelligent people. And I can’t tell you the excitement of kids when they see a whole hog come out on the spindle. I remember as a small child going to Shaky’s Pizza and standing in the window and watching them throw the dough up, and just my faced glued, and I thought this is what I want to be when I grow up. And it was the entertainment. And along with the hog, you don’t get nearly as much yield, but it is the fun, it’s the presentation, it is something unique that you don’t see anywhere you go, a whole hog cooking in front of you. To just kind of make a more fun, family atmosphere was our intention. Now, something I forgot to ask you earlier, this bus with the pigs on it, that’s the bus you used to pick the people up? Yes, that’s the original vehicle. And it had the pigs on it then? And that was after it became stationary? My husband’s best friend got married about five years ago and he came to me and said, ‘I want to borrow the pig bus.’ That’s what we’ve always called it. I said, ‘NO!’ He said, ‘I’m going to be the designated driver.’ And they went to tittie clubs and they had more fun in the pig bus than the did in any of the bars. People laughing at them. They were laughing at themselves. Ten guys having a blast in this pig bus. It makes you laugh. It makes you smile. And it made the bachelor party something to be remembered versus just girls. It was this… Who else has been in a pig bus during their bachelor party? And so it’s full of trophies now? Right now. I just ran out of room during Elvis Week to put all of my trophies. It’s still drivable. It’s still runs. But at this point now people are more pleased in being picked up in the pink limousine. When you tell them, ‘There will be a pink limousine at the door to pick you up,’ they’re, ‘Aw! A pink limousine!’ And that’s exciting. Now the pig bus, we do use it occasionally, but at this time we’re just not because we’ve got four running limousines and it’s just not necessary. Is there anything that I haven’t asked you that you want to say? The only thing I can think of is that we’ve been fortunate to change with the times, and change with Elvis, and just be successful for thirty years, and we’re really lucky. I remembered another question I needed to ask. 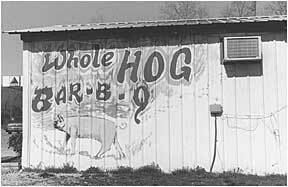 Where do you get your pigs from that you use when you cook whole hog? We buy them from Fayette Packing. We get them straight from the slaughterhouse. We go down and pick them out. 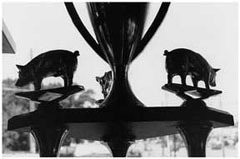 On this rod [the one currently occupied by the plaster pig] about a ninety-five pound pig is about all he could take without bending the rod. But when we do competition, which we’re doing this weekend, we do about a hundred and fifteen, a hundred and twenty pound hog, and he has to be really pretty. So, you have to pick one out with pretty ears. And you go in and it’s just like picking produce? Exactly. Straight from the slaughterhouse. They slaughter them there. So, it’s as fresh as fresh can be. So you walk through and they’re all just sitting there? 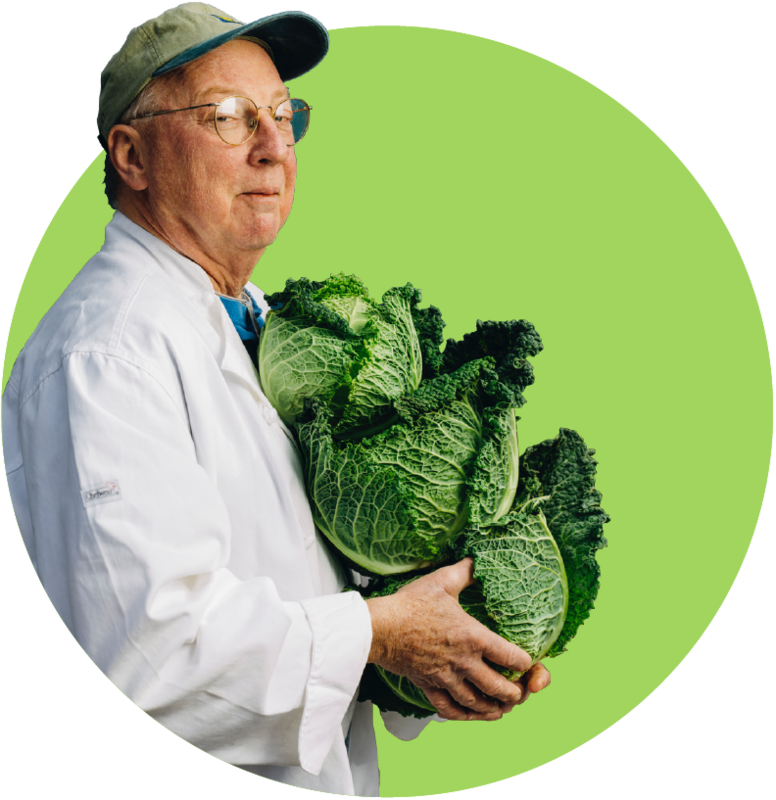 We’re just able to go in and you pick out the freshest… Even when you walk around the produce store, you move things around and pick the one you think is the prettiest. And it’s the same thing with down there. Right. Blazin’ Bacon is the original team and we offshooted to City Hogs, which is the one we’re competing under right now. They are in the top twenty nationally. They have not got a Grand Champion this year. They’re a little disappointed, but they’ve gotten second place, which is still not perfect. But they’re trying and they’re competing this weekend hopefully to get a Grand Champion in whole hog. Tim Alread is a lieutenant for the White Haven Police Department and he is our team captain. And how many people are on the team? There are five and a lot of them are very sweet wives that work very hard for their husbands. But there are two main cookers and three helpers. I’m one of the helpers. I don’t do too much of the cooking, but I enjoy it very much. Do you cook it here and take it somewhere? No. You have to cook it on site. It’s inspected. The rules are here and we do Memphis In May sanctioned events. The meat is inspected before cooking. You’re unable to marinate them or prior prep them. Everybody has the same amount of time to cook their meat, either whole hog, or ribs, or shoulders. But it’s all up to you on the property. So, if you get the fire a little too hot and you burn him, you’re done. And how long does it take y’all to cook a whole hog? 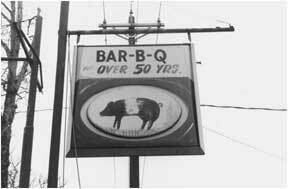 It takes about twenty-two hours to cook a whole hog and about the same amount for shoulders. Ribs we run around ten hours. So, we’re able to cook those within a day. We start those in the morning and by the evening we’re able to pull those out for fresh serve to the dinner crowd that night. Yes we do. Not nearly as often as we should. Sometimes you’re just too busy, because it does have to be added afterwards. I like hickory. Not everybody likes it because it definitely gives the meat a real unique flavor. I have found that more time than not I’ve had people enjoy it maybe a little more than putting the hickory in it. But we do use hickory. The charcoal that we use also has hickory in it. So, it has a little bit of flakes in it. We use the smoked ham from the pig for the Elvis Burger, the only Elvis Burger sanctioned by the Elvis Presley Enterprises. An Elvis Burger is just a hamburger that we chargrill, but we use the smoked hog, you know, the smoked ham. We cook it on our pit and we use that for ‘The Burger for the King Himself.’ We use the ham, and bacon, and cheddar cheese. So it’s a hamburger with ham and bacon and cheese? Yes, and that’s is called our Elvis Burger with the rights from the Elvis Presley Estate that says it’s an Elvis Burger, too. Has anybody ever eaten more than one? Unbelievably, yes. They’re eight ounces each. And I have… I wish he was here. He worked at Federal Express. His name was Barry. Barry could sit down and eat two Elvis Burgers with only one order of fries, not two. And he was this little bitty… He was no bigger than you. Did Elvis used to eat the same kind of thing? Yes he did. That’s how we came up with that. The toppings that are on the burger are the toppings that he liked. 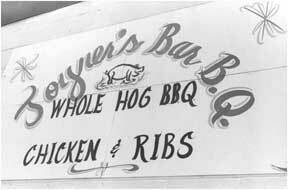 So, back when it was called White Haven Ranch House in the ’70s, before he passed away in ’73, that would be what he wanted on his burger. 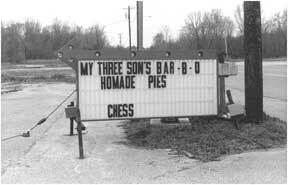 So, that’s why Elvis Presley’s estate was kind enough to allow us to name it after him, because it was something that he chose, and he chose to eat here a lot. So it was White Haven Ranch House and then y’all bought it? We owned it then. We opened it as White Haven Ranch House. In 1973, my father opened this. It was not a running restaurant at all and he opened as White Haven Ranch House. 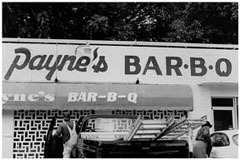 We served grilled hamburgers, the sliced roast beefs, the first salad bar in White Haven. Beautiful, cute girls in short blue jean skirts and cowboy boots and cowboy hats and they had a wonderful crowd. Lots of people, lots of fun. But in 1982 was when we went to Marlowes. 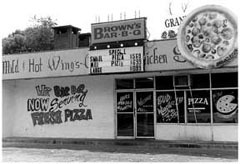 By then, in that ten year span, the area had changed and we were going with the changes versus becoming just another fast food restaurant, which we were the first fast food restaurant in the area. And so we decided to be more of a finer dining, sit down service type of restaurant.